Maradona, despite his god-like footballing status in his homeland, has placed the national football team, an almost sacred entity in itself among the loyal fans of Argentinean soccer, in something of a mess. Maradona must swallow his pride and play Messi in his best role. Argentina have failed to reach the World Cup just once - after a draw against Peru in a qualifer for the 1970 finals in Mexico - and history nearly repeated itself this weekend. Once again, a draw with Peru would have condemned Argentina to miss the party. And things looked bleak when, through the driving wind and rain, Hernan Rengifo, a striker who plies his trade in Poland, drew the home side level with Maradona's men. It looked a dagger blow for Diego's under-performing squad of millionaires and the end of his controversial spell in charge. But then up cropped one of his selection gambles, Martin Palermo, a striker who played alongside his coach at Boca Juniors in Maradona’s retirement season 12 years ago, to tap in a dramatic winner in the fourth minute of injury time. Maradona magic or just plain lucky given his messy situation? Actions on the pitch aside, can you imagine what Maradona’s collective team of doctors were thinking for those three minutes it appeared Argentina would not win? His blood pressure must have hit the roof and his memorable celebration, sliding full length on the muddy pitch give some idea of his relief at redemption. And speaking of pressure – has it ever be more intense for Maradona or Argentina than ahead of the Wednesday evening kickoff in Montevideo against Uruguay? Uruguay also have designs on clinching the fourth and final automatic World Cup spot from South America and are tough at home. Ecuador, who are favorites to clinch fourth spot, play Chile who are already qualified in third place and may not be too bothered by the outcome. On top of this, pundits are claiming that the best Argentina can hope for is to clinch fifth in the group and go into a playoff against a team from the CONCACAF region which they would be heavily favored to win. But Argentina need to improve to even secure the draw they likely require as a minimum and they need their superstar Lionel Messi to step up to the plate. The Spanish sports newspaper AS is reporting there is a rift between Maradona and his talisman, who is being deployed in a different position than he plays for Barcelona and is apparently disillusioned by the tactics employed by the coach. Maradona must sort out this situation fast or he will be looking for a new job on Thursday morning, which would be a shame because whatever one's opinion of him, he is box office and the World Cup finals will be the poorer for his and Argentina's absence. While a World Cup without arguably the best player in the world in Messi is surely unthinkable. 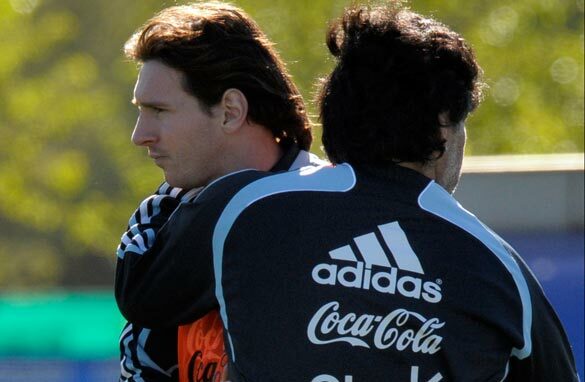 Some heads need to be banged together in the Argentina camp starting with the football icon and his legendary boss. world cup without argentina will not make any diffrence. There seems to be a mistake. You wrote: "...through the driving wind and rain of Lima...". The game with Peru took place in the Monumental Stadium, In Buenos Aires, Argentina (where River Plate plays home). It rained there, not in Peru. Definitely, the Saturday 10th. game mentioned in the note was played in Buenos Aires ( Argentina ) and NOT Lima ( Peru ). Were the writers watching the match or just wrote from " hearsay " ? Furthermore, if and when Argentina loses tonight`smatch, why would Maradona looking for another job tomorrow? Nobody will kick him out and he said he would not resign. Remember that even if Argentina loses tonight there is still another chance / game. Did argentina play home or away? n if they dont come to worl cup, then what? Must they be there? The game was held in Argentina, not Peru. Ecuador being favourites to be 4th? you must be joking. With luck they will be 5th, and by the guts shown in Quito, they will come in 6th and out. World cup will be beautiful in Africa without Argentina.Maradona is stubborn and his pride would cost him a place in world cup.He should swallow his pride and invite Riquelme into his squad. Quite frankly, Argentina's chances are very slim because Uruguay are a fantastic team presently. And they would not want to disappoint their fans at home. But personally i would love to see Argentina and Maradona at the World Cup. Maradona was a genius as soccer player, but face it, lacks all intellectual, mental and management skills a coach should have. Poor Argentina! No one will miss Argentina with all those other great teams playing. If we want to see Messi playing great football and scoring goals, switch your channel to the Champions League and watch Barcelona. There he gets all the support he needs to play his game! World Cup without Argentina will make HEAPS of difference – the rivalry between Argentina vs England is always the most interesting of every world cup given various aspects of their past history (ie Falkland, Hand of God, etc). Messy played lousy games, even with Uruguay, and actually if he was kind enough to watch the game, Maradona was able to establish a good team, good tactic and Argentina deserved to win against Uruguay, against Peru it was a miracle Argentina won, and I believe from now on, Argentina is going to go only upwards, all the way until getting the world championship. Leave Rush alone. He has done nothing wrong. Maradona needs to have a better team to second him, you do not hear about anyone else but him, but surely there are other Argentine coaches whom he respect and can work with to 1) better accommodate Messi in the squad's game 2) study the plethora of talents available and 3) find the good system to make them a powerful team for the WC. Argentina is WC royalty like it or not, they made it to the finals on direct qualification, no playoffs, so let them work to a new WC crown. They can earn it, whether Riquelme wants to comeback or not. As a northamerican who has lived both in Barceona and in Argentina it is quite evident that the way Messi plays for Argentina and the way he plays for Barcelona are like "dia y noche" nada que ver...Messi although a born Argentinian hasl lived in Barcelona since the age of 13 ... his heart in Barcelona and that is where he should stay. He only makes Argentina look worse!!!! Mr author .. even if Argentina would have drawn, they could have qualified. Get your facts right. This story is not about Africa, where everyone can write negative things and the readers got no where to get the facts to verify the story. I am looking at the South American log now.. and Uruguay has 24 points and Ecuador 23 points. My little maths tells me even if Argentina would have drawn they would have had 25 points and they would still have qualified. welcome to africa,Lionel messi ,but for Maradonna i dont care !!! Lionel Messi will have an important role to play in South Africa. Footballers of the calibre of Leo are a treat to watch. Best wishes. Congrat Argentina. A win is a win. Practice hard and we'll see you in action 2010. I hope for all the best. i wii like to see Argentina at the world cup. I would like to see Argentina at world cup. Most of all I would love to see Maradona. Maradona is legendary in the world of soccer. Argentina's absence from the World Cup is somewhat of a tragedy.